Call it a logical progression if you will. 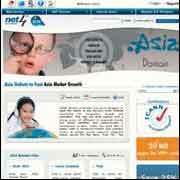 After successfully launching the .in domain name in 2005, Net4, India’s leading IP communications service provider, has tied-up with DotAsia Organisation to launch the first Asia-based generic top-level domain .asia. Says Desi Valli, Executive Director & COO, Net4: “With global brands setting up offices in Asia and companies in the region in diversification mode, it makes sense to have a regional identity.” Net4 had managed to get 30,000 registrations in 45 days for .in domain. It now aims to replicate the success for the new domain name by offering huge discounts during the five-month sunrise period; it will cost Rs 1,200 before February and an additional Rs 4,000 afterwards. DotAsia, the organisation administering the domain name, is running several sunrise periods so that holders of valid trademarks and company names can register early for their domain names and protect their brand identities from cyber sqautters.